In the summer of 2013, the Brooklyn Nets pulled off a blockbuster trade that landed Paul Pierce, Kevin Garnett and Jason Terry from Boston. A trade that turned out to be a complete disaster. Certainly not to my surprise. “I’m much happier,” he said. “It was a tough situation (in Brooklyn) last year. Horrible, really. “It was just the guys’ attitudes there. It wasn’t like we were surrounded by a bunch of young guys. They were vets who didn’t want to play and didn’t want to practice. I was looking around saying, ‘What’s this?’ Kevin (Garnett) and I had to pick them up every day in practice. 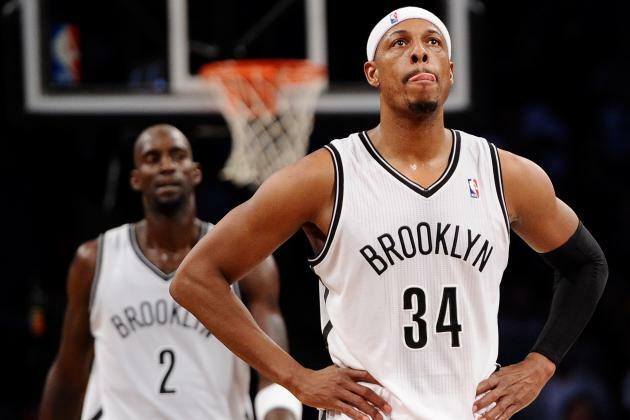 “Before I got there, I looked at Deron as an MVP candidate,” Pierce said. “But I felt once we got there, that’s not what he wanted to be. He just didn’t want that. Pierce was certainly spot-on when saying the team would have packed it in had it not been for him and KG. Just take a look at the team this season. They’re struggling to get into the eighth spot in the Eastern Conference. They had a gutless performance against the Chicago Bulls Monday night in a must-have game for their playoff hopes. This Nets team has no heart whatsoever. And if they’re lucky enough to have Brook Lopez opt-out of his contract after the season they should slam the door the second he leaves the building. But he’s only a small part of the problem. At least he’s shown up the last few weeks and played his best basketball. Brooklyn still has the most untradable contract in the entire league. Deron Williams is locked up for two more seasons and Joe Johnson for one more year. This team is essentially in salary-cap hell until those two guys come off the books. Oh, and when they actually have their draft picks back. This organization traded their 2014 first-round pick (Celtics selected James Young), 2016 first-round pick, Boston has the right to swap 2017 first-round pick AND they dealt their 2018 first-round pick to acquire three players that could barely play ten more games effectively let alone lead them to a championship. And on top of trading away those draft picks, the Atlanta Hawks have the right to swap 2015 first-round picks as a result of the Joe Johnson trade in 2012. The icing on the cake of this absolute disaster would be if Brooklyn didn’t make the playoffs, somehow hit the lottery and the Hawks were awarded the pick. It would honestly be well deserved after the stupidity of these two trades the franchise has made. And people criticize the Knicks for trading away picks. You may not see a worse trade than this one for the rest of your lifetime. Unless of course the Nets find another trio of 35+ year old guys to mortgage their entire future for again.